Web Based Recruitment announce new Social Media and Mobile Master Classes for their Annual Conferences. Social Media and Mobile are changing all the time so its important to keep up to date with the latest trends, case studies and strategies. Now in its fifth year, the 2013 Social Media in Recruitment Conference has a brand new format with the introduction of Master Class sessions to help recruiters maximise the use of social media when recruiting. 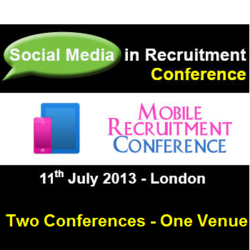 The conference on the 11th July 2013 takes place in London in conjunction with the Mobile Recruitment Conference which will also feature separate Master Class sessions. "Facebook spoke at our first Social Media conference in July 2009. At that time they had just reached 250 million users (they now have more than 1.1 billion users!). If you add to that the fact that social media offerings like Google + and Pinterest didn’t even exist in 2009 then you can see just how quickly things have changed." Web Based Recruitment ran Europe’s first ever Social Media in Recruitment Conference back in July 2009 and the world’s first Mobile & Video in Recruitment Conference in September 2010. Over the last four years more than 1,000 delegates from 23 different countries have attended the conferences organised by Web Based Recruitment.